Weddings are not only a celebration of love, but also a declaration to friends and family of your lifelong commitment to each other. It doesn’t matter how big or how small the ceremony or reception, the idea of a wedding is that it includes people who mean a lot to us. 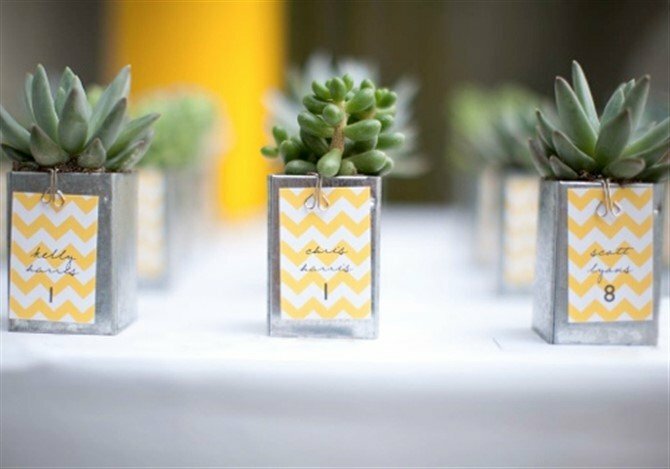 A thank you to your loved ones by way of a gift is often customary, but if you want something that will truly make your guests feel special, explore these 12 unique wedding favour ideas. 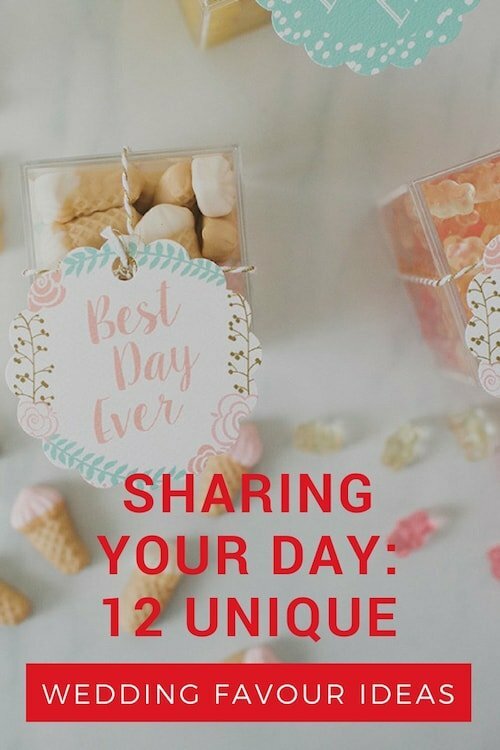 Ready to share your special day? This super sweet treat is an absolute delight! Given pretty much everyone loves fresh honey (don’t they? ), it’s something guests will happily take home and enjoy at their own leisure. It sure beats sugared almonds! 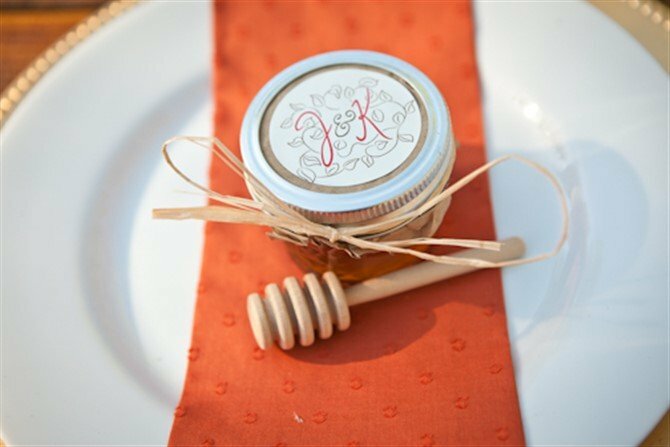 This DIY wedding favour is simple and affordable to make, but has such a massive ‘Wow’ factor. The bonus is that it doubles as a unique place name – much more fun than a card holder. This one’s a keeper with friends and family highly likely to put this gift pride of place on a windowsill at home. 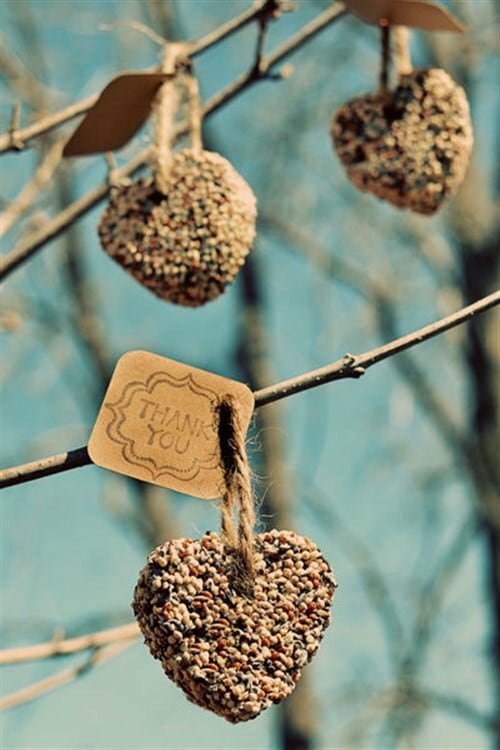 This unique and eco-friendly idea is all about gifting your guests something that will see your love spread all across the community – something the birds will enjoy doing for you. It’s a super simple DIY project – just be sure to make them a few days rather than a few weeks out so they are fresh for the day. 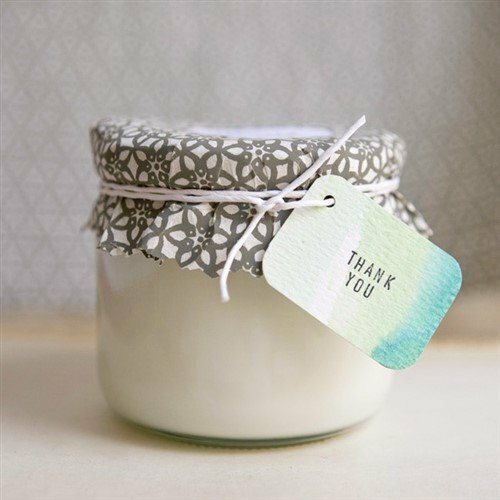 These soy candles are not only made using recycling materials and natural ingredients, but are super cheap to make. There’s a bit of work involved, but the result is just so precious. Something your guests can take home to light up their lives – with love! I want to get married all over again just so I can do this! It’s just so personalised. 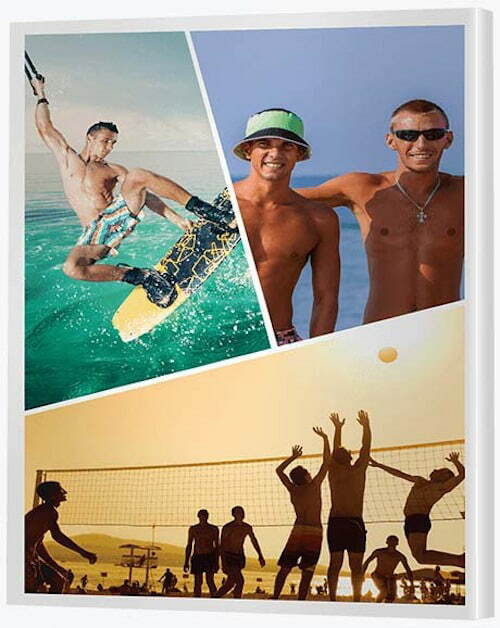 The idea involves finding a photo (or photos) from your past of your friend or family member with yourself and/or your partner and printing it on a single or collage canvas. It becomes a treasured keepsake for guests – the sincerest, dearest of thankyous. More sparkly than rice. Less sticky than bubbles. This gift is one to be shared right there, right then. 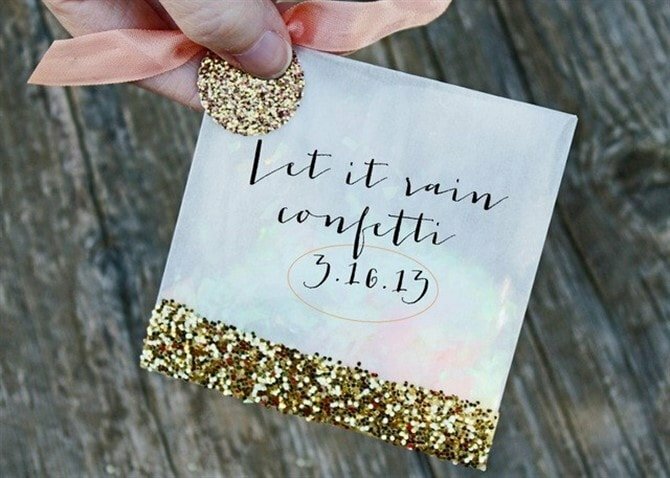 If YOU love glitter, after your reception when you’re ready to leave, let your guests shower you with all the glitter you’ll ever need. You’ll likely enjoy it right through your honeymoon and beyond. 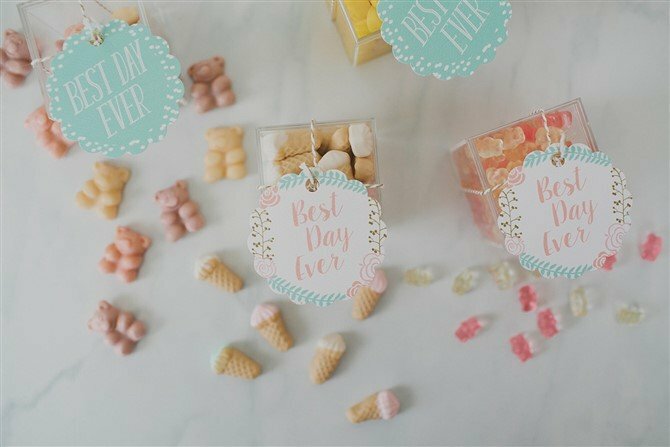 Move over sugared almonds, it’s time to get serious about wedding favour lollies. Head down to your favourite bulk confectionary warehouse and choose a style and colour of lolly that suits your theme. Rather than putting them in a big jar at the candy table, box them up as gifts for guests. They won’t be too shy to eat them then! Add some magic to your reception with some fantastical gifts chock full of rustic charm. 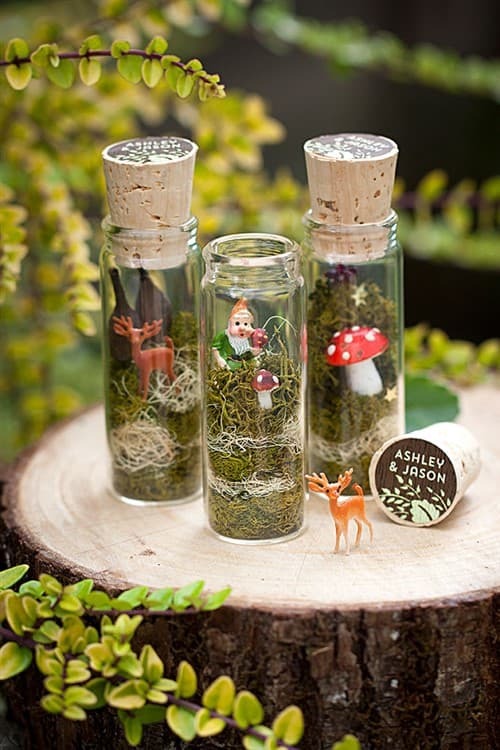 These DIY terrariums are full of moss, metallic stars and tiny figurines. Choose a figurine to suit your theme. This is a wedding favour with a difference in that your guests get this as a gift before they even attend! 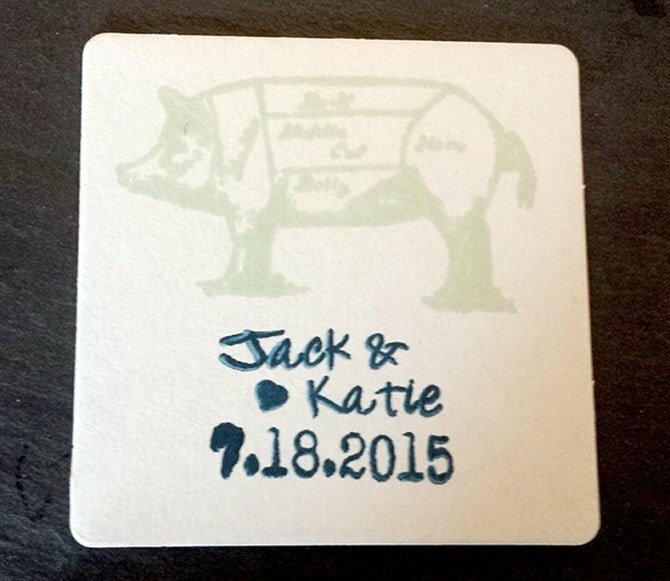 This funky ‘save the date’ stamped coaster is a wonderful way to inspire excitement for your big day (and get those RSVPs coming in thick and fast). It’s never too early to treat your loved ones. Get the reception party started with this fun gift for guests. Can’t you just imagine granddad decked out in a pair of these? This is all about amping up the fun factor for everyone – giving them the opportunity to break the ice with those strangers at their table and permission to let their hair down. 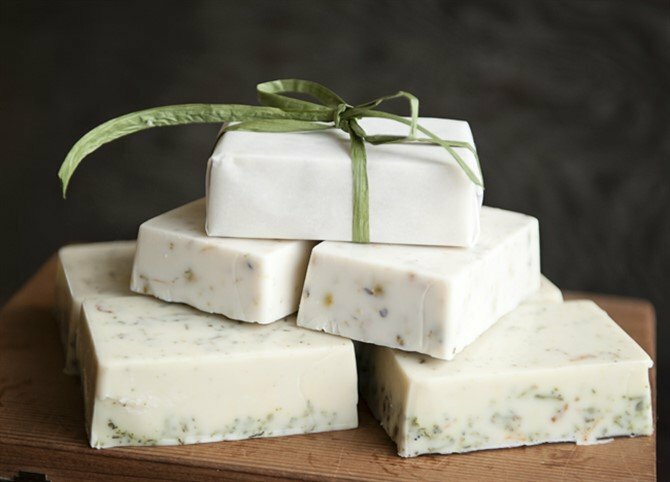 When we plan our wedding event, we often cater to many senses – sight, sound, taste – but with this gift in the mix, your reception will also smell like absolute bliss. This eco-friendly idea, with limited wrapping (or waste) involved, is surprisingly easy to make. This gift is more about the ribbon and less about the box. In fact, it’s more about the ribbon and less about the gift! Who even cares what’s inside? 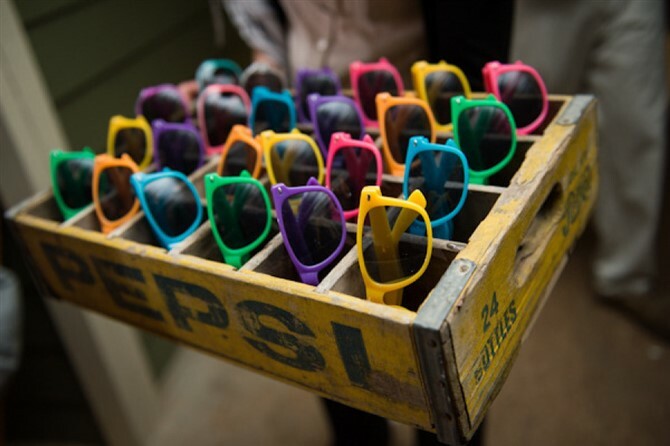 Getting the packaging right is half the trick to impressing your guests. 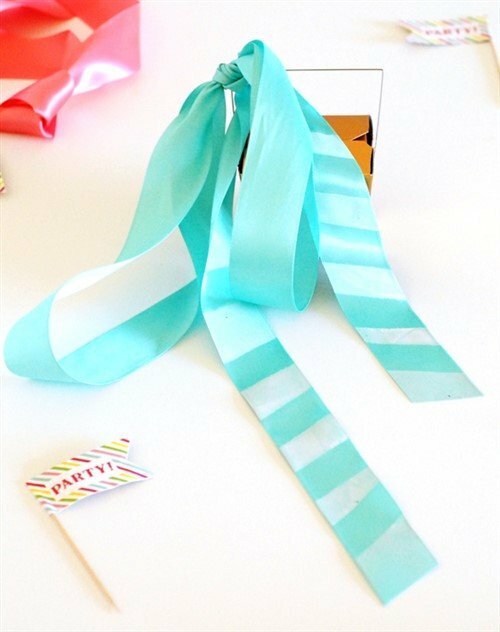 With this DIY idea, you don’t have to spend a fortune on fancy ribbon. Just get creative.